Hi Cheryl. 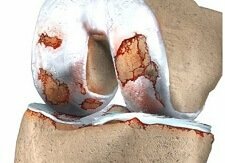 It is fairly common to get swelling with knee arthritis, which often fluctuates. There are various things you can try to treat a swollen knee such as elevating the leg when resting or wearing tubigrip compression bandage. Getting the swelling under control will likely reduce any knee arthritis pain as it takes the pressure off the knee joint.